Worlds of Fun in Kansas City, Missouri is a Crown 36" gauge operation. Missouri also has the Silver Dollar City operation in Branson, and then there is the almost historic Wabash, Frisco and Pacific in Glencoe. I believe there is a huge 15" gauge private railroad in this state, but was put up for sale after the owner past away. Montana used to have an operating steamer at Alder Gulch, but I believe it is in storage. The zoo railroad in Omaha, NE is a fine operation with a Crown and an imported locomotive. I don't see any park trains in AR with steam, but perhaps there is something. WF&P operates every Sunday, from the first weekend in May, to the last weekend in October. There is also a 36" Crown in St. Louis, MO at Six Flags, running on a regular basis. ATT&NW is not operational at this time. No one knows what the future holds for the railroad, now that it is up for sale. Silver Dollar City has made phenomenal progress on their motive power fleet. They have introduced two new (to them), completely overhauled steam locomotives to their fleet, and their railroad is quite something to see. Some major grades and twists and turns. You would be surprised if you realized what you were looking at. Their CMO has done a wonderful job leading his team in the overhauls and operation of the railroad. Has a pretty comprehensive list of theme park steam. Some pretty cool engines out there. Here's a new story about additional funds being raised to aid in #81's restoration. I can't wait to see how good she will look when she is finished and running again. Here is the newest update from the UP regarding #4014's restoration. The king is almost here! Also, the UP steam team started hydro-testing #4014's boiler yesterday. It is also covered in this thread. The 3' gauge railroad at Dry Gulch USA in Adair OK is mentioned above. The railroad is now closed and has been sold. It is being moved, & hopefully an announcement can be made in a year or so about future operations in a new location. I believe it will be exciting news! PRR 1361 May finally have a new lease on life after being silenced for decades. Bennet Levin has announced the planning for a new boiler for her. Hopefully she will finally be able to hit the high iron again and possibly double head with 5550! "The rebuild of the Shay got a partial state grant to finish firebox work. The rebuild had been an ongoing project for a decade or more in Libby. It is a 1906 Lima product with 2 trucks and was largely the mill switcher. Nice reporting by the newspaper." I believe its either Missouri, Oklahoma, or Arkansas that has the operating Santa Fe pacific, but could be wrong on that one. I believe you are referencing the 3415 at the Abilene and Smoky Valley Railroad. She has been running since 2008. I'm not familiar with the 2ft. gauge locomotive in Minot. I searched steamlocomotive.com, steamlocomotive.info, and some basic "googling" without any results. Can you tell us more about it? Official statement on steam on the Heber Valley. 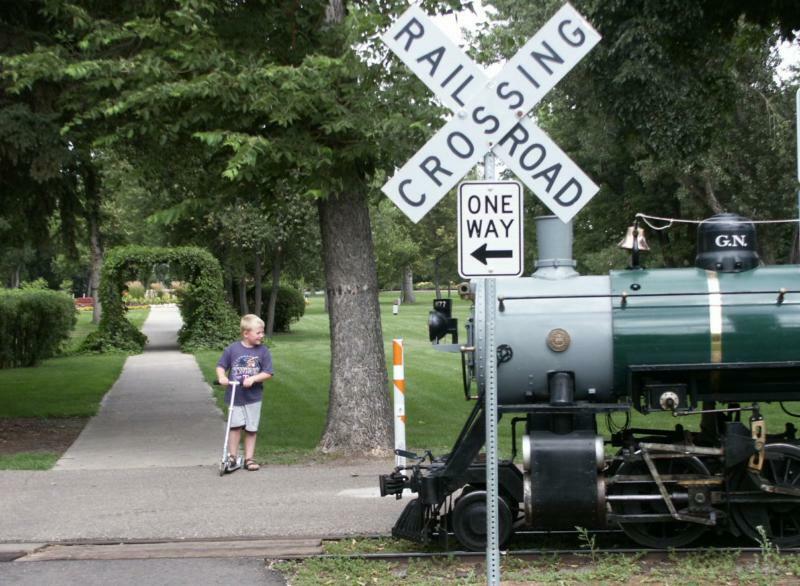 HEBER CITY, Utah — When fans gather in Utah in May to celebrate the 150th anniversary of the transcontinental railroad, one iconic steam locomotive will be conspicuously absent: Heber Valley Railroad’s Union Pacific 2-8-0 No. 618. Thousands of enthusiasts will be in nearby Ogden and Salt Lake City for the sesquicentennial of the Golden Spike on May 10 at Promontory Summit. The National Railway Historical Society, the Railway & Locomotive Historical Society, and the Union Pacific and Southern Pacific affinity groups are chartering a train at Heber on May 11 that will be diesel-powered. Union Pacific 4-8-4 No. 844 and Big Boy No. 4014 will be under steam at Ogden Union Station that day, and the National Park Service’s replica’s replicas of Central Pacific No. 63 Jupiter and Union Pacific No. 119 will be running at Promontory for the re-enactment. A 1907 Baldwin product that first steamed at Heber in 1971 and last ran in 2010, No. 618 will be in the shop at Heber City. No. 618 is nearing the end of an extensive multi-year restoration and 1,472-day inspection that includes converting the locomotive from coal to used motor oil for fuel, Nelson says. Work in the last six months has focused on the tender, reworking the trucks, and patching the sides. Besides installing the oil tank, the tender is ready for paint. As for the locomotive, Chief Mechanical Officer Mike Manwiller has completed running gear work, and has tubes ready for installation, Nelson says. A new fire door has been cast. “It’s really a labor thing for us,” Nelson says, citing heavy patronage and the acquisition of three GP9 locomotives to pull the trains. The railroad has increased ridership to 110,000 over the last five years with 40,000 of those passengers coming during the holiday season on 81 North Pole Express trains. Running and maintaining those trains have taken people away from repairing and reassembling the steam locomotive. AT&SF 4-6-2 #3415 runs in Kansas. If I'm not mistaken, she runs between Abilene & Enterprise, KS. Just in case anybody missed the news, Big Boy #4014 has passed his hydrostatic test. This is excellent news for the UP! They are now one step even closer to having a Big Boy run under his own power again since 1959. I, personally, won't be able to attend his big debut, but if/when he makes his way to St. Louis, I won't be able to stay calm when I'm standing right next to "The King of Steam" and all his glory.